Roger was recently diagnosed with Alzheimer’s disease. At 73, he still considered himself fit and healthy, at least for his age. The diagnosis wasn’t a complete surprise, though it wasn’t easy to hear or accept. He had been dealing with memory loss and other similar challenges for a couple of years; he just kept putting off a visit to his doctor because he didn’t want to know something like this. When he was initially diagnosed, his family was thinking about all the prospective options available to him, including memory care assisted living. They didn’t discuss this with him, though. They were afraid of how he would respond to the topic being brought up. After all, being in relatively good physical condition, having great strength for someone his age, they knew he would want to be home for as long as possible. However, they also understood this was going to place undue pressure on his wife as the disease progressed. Instead, the family talked among themselves about various care options in the years ahead. When Roger was 76, it became clear his memory loss was so significant that he was not safe when left alone. This meant his wife had to wait for a friend or other family member to stop by to look after him just to get out for a little while. It was taking a serious toll on her and that’s when the topic of memory care assisted living was discussed again. At the time, Rogers still had lucid, cogent moments, but had a difficult time accepting the prospect of assisted living. He became nervous, anxious, and worried. The concerns he had weren’t about being unsafe in a new environment, but not having the same familiarity he had at home. Roger mentioned that it sounded like a great idea, but he just wished they had talked about this from the beginning, when he could have contributed more to the discussion and determined that this would really be the best option for him. If it was the best option, he said, he would have liked to have moved sooner rather than later. When somebody is diagnosed with Alzheimer’s or another type of dementia or has other memory related challenges, it’s important to discuss assisted living as soon as possible. 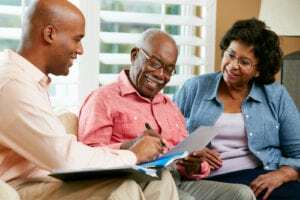 That doesn’t mean the senior needs to move in right away, but since dementia is a progressive disease, contributing to these decisions and discussions can become much more challenging and potentially frustrating for the senior by waiting. Don’t wait; talk about it as soon as possible.